3/20/15 Our stay in Monterey came to an end this morning as we got going at 7:30AM, continuing north with our next stop at Half Moon Bay. Only about 60 miles up the coast we cross the Monterey Bay and its canyon. This picture is the entrance to Monterey Harbor. Its actually about 50' wide but it does not look that way from the helm. Just inside the fairways are all to starboard, so tight we can't make the turn without stopping and "backing and filling" to turn WORKNOT in such a tight circle. Kinda like parallel parking but with wind and current. We ran in fog that was broken and scattered as we crossed the bay, about 20 miles. About 3 hours out the fog broke and suddenly 100's of dolphins came to greet us. Its always a treat to see even one or two but this was a real collection. This picture does not do justice to the number of dolphins that streamed across the bow. It lasted about 15 minutes and they always add to the trip. Our trip continued with mild seas, overcast skys and not much to report. So far we have enjoyed exceptionally good sea conditions and light winds. What's a bad day for sailboats is ideal traveling for us. At 4:30 PM we were "anchor down" in Half Moon Bay securely behind the seawall. This was one of our favorite escapes from the SF Bay area. 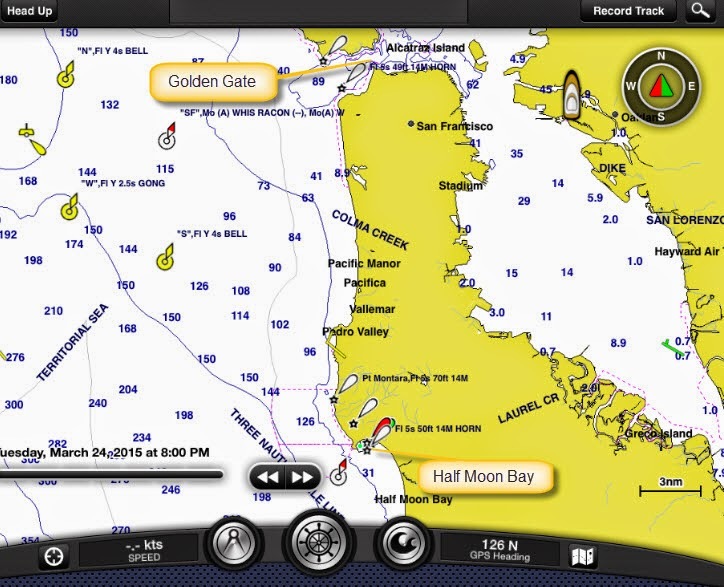 Great seafood, lots of room to anchor, several nice restaurants and only a few hours from the Golden Gate.